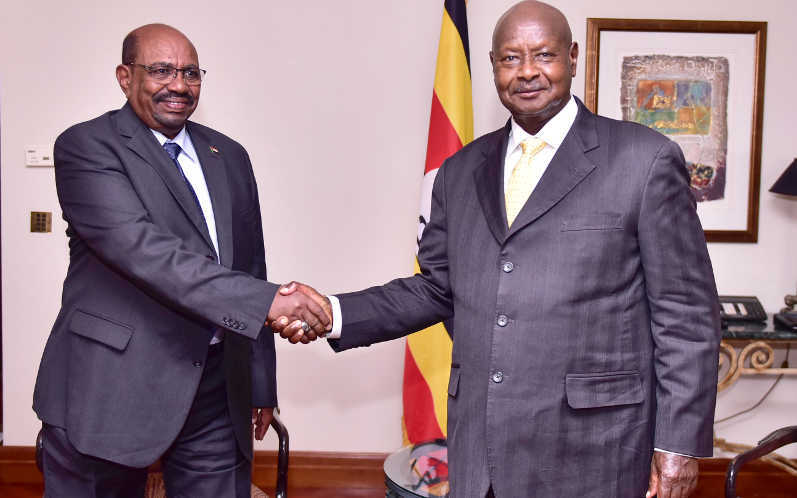 President Yoweri Museveni (right) meets President Bashir of Sudan at the Sidelines of the the 32nd AU Summit in Addis Ababa. Bashir’s departure is attracting focus and attention to Museveni’s long stay in power. President Omar al-Bashir has become the latest casualty to the Arab spring movement – that have been characterised by political uprisings staged by ordinary people against long-serving leaders or dictator. The Sudanese Minister of Defence Awad Ibn Ouf said the army had decided to oust Bashir and oversea a two-year transitional period that will be followed by elections. But the fall of Bashir should trigger some goose bumps amongst some of you regarding the growing after-effects of the people’s revolutions that have swept most Arab countries where the Arab Spring movement has taken place. As we speak, Bashir is the fifth president to have been deposed through protests. The so-called Arab spring started in 2010 when thousands of young people stormed the streets of Tunis in Tunisia to protest poverty, inflation and unemployment. The protests were triggered by a young man Mohammed Bouazizi, who set himself on fire after failing to provide for his family of 8. In three weeks of massive protests, President Zine El Abidine Ben Ali had fled Tunisia into exile in Saudi Arabia where he still lives. Ben Ali had been in power since 1987. But the heroic acts of Tunisians inspired other nationals in the middle east who were suffering the effects of oppression including poverty, massive corruption and unemployment. Nearly two weeks after the protests in Tunisia, Egypt was on fire. On January 25, 2011, the country erupted in protest against the government of Hosni Mubarak. A military crackdown that was ordered by Mubarak in which more than 800 people are believed to have been killed, failed to stop the protests. In February 2011, Mubarak announced his resignation effectively bringing an end to a 30-year old stranglehold onto power. Mubarak’s departure was replaced by another military dictatorship under the leadership of President Abdel Fattah el-Sisi. Although President Sisi helped to control the radical policies of Muhamad Morsi, who at one time threatened to invade Ethiopia over the ongoing construction of the Grand Ethiopian Renaissance Dam (GERD), he has been described as a worse dictator than Mubarak. This suggests that until Sisi is removed, perhaps through another Arab Spring, the hopes of Egyptians for meaningful change will remain a pipe dream. It was the violent overthrow of Africa’s longest serving leader of 42 years Col. Muammar Al Gaddafi that should serious apprehension among enthusiasts of popular uprisings. No longer had Mubarak left the chair, than protests erupted in Libya’s eastern city of Benghazi. Gaddafi responded by using military force. Protests expanded and attracted armed fighters and the intervention of French warplanes and US drones. At the beginning of this month, April, the ailing president of Algeria Abdelaziz Bouteflika capitulated to pressure from protesters who were opposed to his re-election bid, despite the fact that he has been ruling from a wheelchair for several months now. The 82-year old’s departure didn’t satisfy protesters who claim that the caretaker president Abdelkader Bensalah belongs to the old guard they want to be swept aside. Besides Sudan’s strategic importance to Uganda, as the biggest importer of Uganda’s coffee, a military regime in the desert country does little to assure lovers of a stable neighbour. With the exception of Tunisia, all post-Arab spring countries have degenerated into chaos or metamorphosed into another military dictatorship. It is also worth noting that while the Arab leaders have suffered the effects of overstaying in power such as corruption, many presided over economic miracles that saw their countries rival with countries such as Spain, Portugal and Greece. There are some who argue that the Arab spring and the corresponding chaos that has been witnessed some of the countries is used by some western powers to infiltrate and disorganize development.